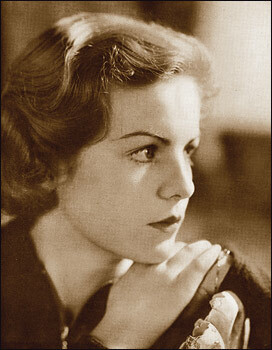 The Dowager Duchess of Devonshire, the youngest of the legendary Mitford sisters reminisces about her life and her correspondence with the charismatic Sir Patrick Leigh Fermor, considered to be the finest English travel writer of his generation. An evening filled with wit, eccentric characters, and a celebration of courage and friendship. 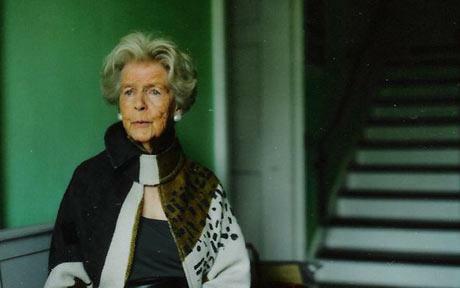 Charlotte Mosley, her niece and editor, joins the Dowager Duchess in conversation. This entry was posted in In Tearing Haste, Paddy's Friends, Video and tagged Deborah Devonshire, In Tearing Haste, Patrick Leigh Fermor on April 18, 2011 by proverbs6to10. I suppose it is a good thing to aim to be objective in life. It shows wisdom and maturity, and an ability to balance all the arguments. For me however, all objectivity vanishes when I think of Ohrid! The setting of this beautiful city on the edge of the vast and wondrous eponymous lake is simply stunning. Although he does not state it specifically, I believe Paddy visited Ohrid and its environs when on a motor tour from France to Greece with Joan in her Sunbeam Rapier in 1960. He tells the story to Debo in a letter dated 23/24 October 1960 (see page 67 of In Tearing Haste). Paddy describes visiting “Serbian Macedonia and wonderful lakes with frescoed Byzantine monasteries on the shores … (which) held us up for days.” There is little doubt in my mind that he is referring to Ohrid, and having been there myself I can understand why; it is a wonder that he ever left! It is said that Ohrid, Macedonia, once had 365 churches although there are now only around twenty-five which remain open. Its name means City of Light and it has over 220 days of sunshine each year. The town creeps up the hillside surrounding a central esplanade and harbour dominated by the statue of St Clement, who was the student of Saint Cyril and his brother Methodius. They were the authors of the Cyrillic alphabet (approx 864 AD) which was created by the Byzantines to bring the Slavic nations into the Orthodox Church rather than let them fall under the influence of Rome during the early days of the schism between the two churches. Ohrid is full of Byzantine history. The influence of the Empire can be seen everywhere from the statues to the fortress but principally in the churches and the ancient Basilica. The original church of St Clement was destroyed by the Ottomans who built a mosque on the site which has a clear view of the Lake. Clement’s relics were secretly moved by the Christian citizens of Ohrid to the smaller and less important Church of St Mary Psychosostria. Over time this church became known as the Church of St Clement, but the confusion is now ended as in 2000 the Macedonian authorities rebuilt the Church of St Clement on the original site. His relics have been moved back there to rest in peace. The site includes the remains of original Baptistry, and there are many mosaics all in very good condition. The Church of St Mary is a wonder. Built in 1295 by the deputy Progon Zgur who was a relative of the Emperor Andronicus II Paleologus, it has twenty-nine scenes from the life of the Virgin around the walls. These frescoes are in generally excellent condition with little of the wear or defacement one often finds elsewhere. The reason for this is that most of the frescoes were obliterated by soot from candles. They were cleaned and restored only since 1960. The have to be seen to be understood. The ‘keeper’ of the frescoes is an amazing Macedonian lady with long black hair, with braided pigtails; the church and the frescoes are her passion, probably the centre of her life. She has produced a long book and the frescoes were the subject of her PhD. She says that the fresco of the Virgin that dominates the Apse is painted from lapis lazuli originating in Afghanistan. That one fresco would have cost something in the order of one kilogramme of gold (at today’s prices that is roughly $56,000). Opposite the Church is the national Icon museum of Macedonia with over forty masterpieces. All this within just a few yards of each other! If you ever get the chance to visit you will find all this and more. You will also meet friendly people, find good quality low-cost accommodation, and a wealth of Byzantine architecture and art. This CNN video shows many of the places I have written about and I know you will like it. If you do ever visit Ohrid, please contact my friend Katerina Vasileska who runs a tourist business in Ohrid called Lost in Ohrid. She will be happy to arrange good accommodation, local tours, and generally be of assistance during your visit. Finally, don’t forget that for the intrepid there is an opportunity to walk through Albania to Ohrid in May of 2011 with the Via Egnatia Foundation. See my recent post Walking back to Byzantium along the Via Egnatia where you can find out more and how to register your interest. Click to play … there is a 30 second ad before the Ohrid movie starts. 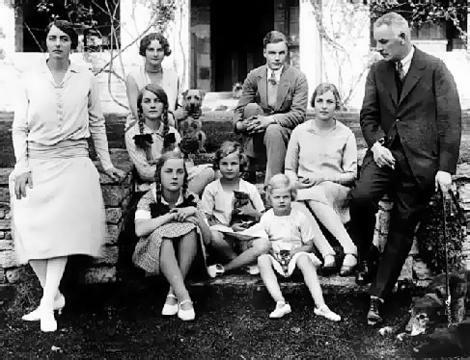 This entry was posted in In Paddy's Footsteps, In Tearing Haste, Video and tagged Deborah Devonshire, In Tearing Haste, Joan Eyres Monsell, Joan Leigh Fermor, Lake Ohrid, Patrick Leigh Fermor on February 13, 2011 by proverbs6to10. After a long, indolent summer chasing dragonflies, and an extended sojourn in the south of France courtesy of ‘Les Sans Coulottes’, the time has come for the winner of our OPRIG GAGINONANUS challenge, Marion Worsley to collect her prize. A full report will follow! To celebrate this forthcoming event I thought we should enjoy the poem that the marvellous John Wells wrote and sent to Paddy after he too received a copy of Paddy’s drawings. Like leaves are born to bud and die. But now, O Prig! O Lax! O Loose! That hour is come! O sunk in crime! His awful Name is manifest! His Name is written on the Wall. 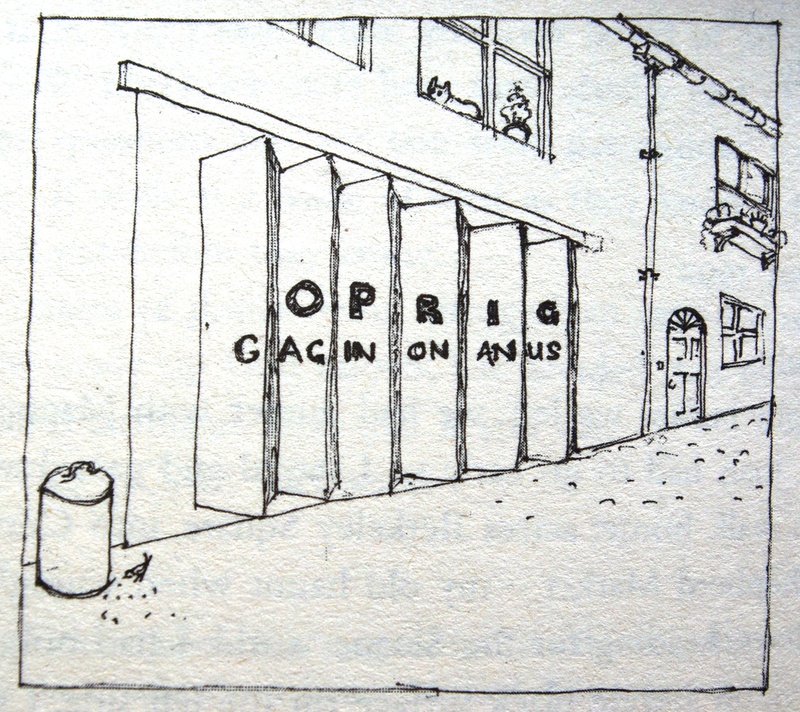 OPRIG GAGINONANUS – a winner! This entry was posted in In Tearing Haste, Paddy's Friends and tagged In Tearing Haste, John Wells, Patrick Leigh Fermor on September 29, 2010 by proverbs6to10. 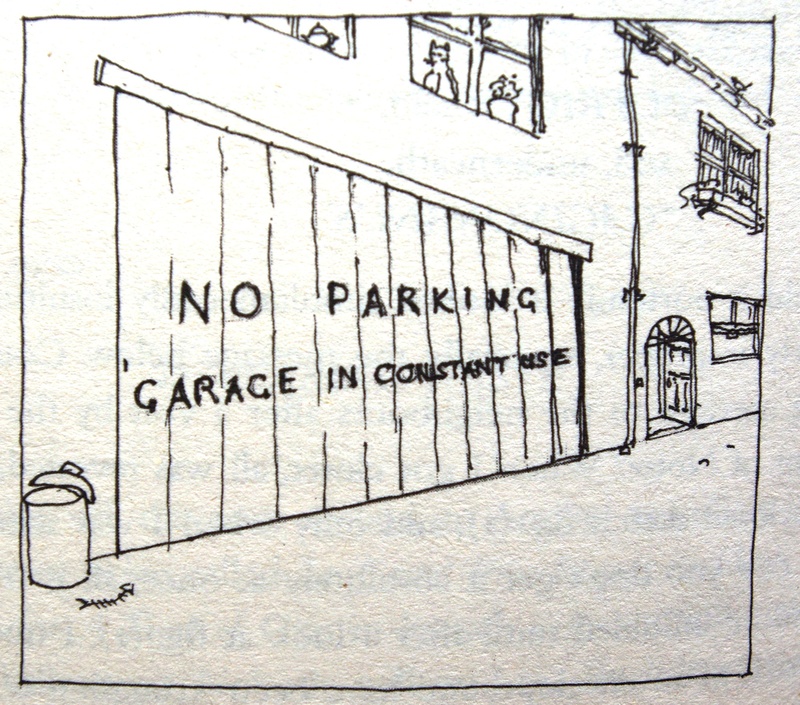 “I am standing in market mews, surrounded by garages and 10 signs to remind any fool who had not spotted the continuous double line that also every garage door is “No Parking. Garage in Constant Use”. This is however the only one with a concertina mechanism. I’m afraid no cat. Could send you a picture of a blue tee shirt hanging out of the window instead? I am now going to walk away as I can see coming towards me the slightly perplexed postman who very kindly directed me to Market Mews but then went on to ask what I was looking for. I vaguely mumbled that I was looking for garage doors, smiled, thanked him and walked on. leaving hanging in the air a question mark over my sanity. I will send you more pictures this evening. Remember the challenge was to try to find the location that Paddy had sketched in his letter to Debo Devonshire and if possible photograph the same combination of letters that faced Paddy in 1992. Extra marks were to be awarded for a photograph including a cat. 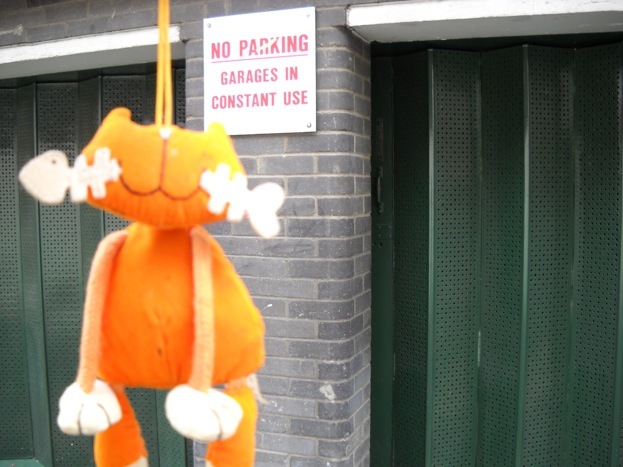 Here are the other photos from Market Mews. Slight artistic license for the cat… but did send you a picture of the tee shirt. I got a tourist who spoke very little English to take the picture. 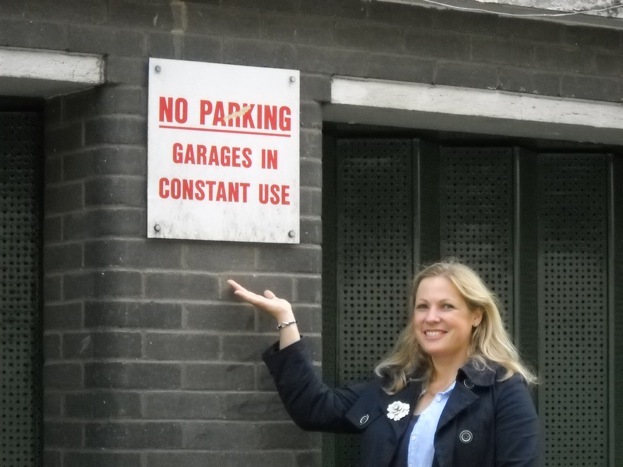 I think that if I had tried to explain to him why I wanted a picture of myself next to a No Parking sign, he would have been even more confused. He will no doubt go back home and tell his friends that it is true that the English are a little mad. 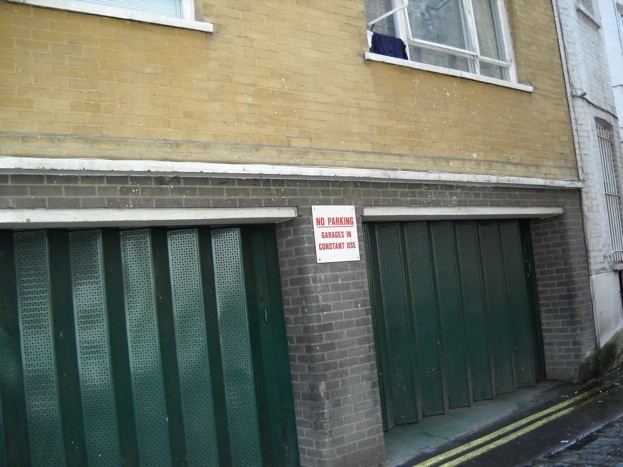 The entire mews consists of garages. I have added pictures of a few more should you want to add them to your Garage picture Collection. 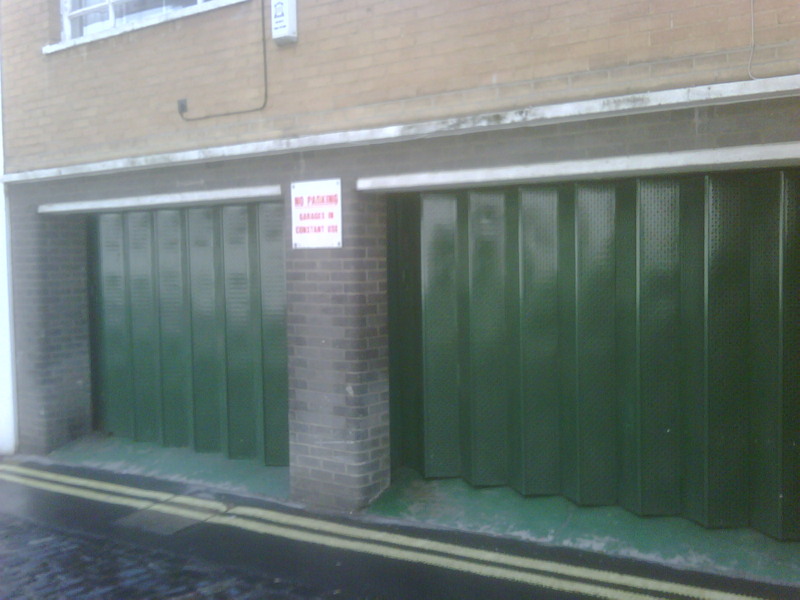 For the purists, the concertina garage is between No 9 and No 11 Market Mews. It is no surprise that one or two things have changed; the doors seem to have been painted over and the cat has probably passed away. However, I was so pleased that a blog reader was inclined to be more than a little crazy and take up the challenge with such style. The ‘cat’ was a piece of improvised genius. Very well done to Marion. We are planning an official presentation ceremony ‘on location’ later in the autumn. As you can tell she is a lady with some pretty mad ideas, one of which includes the possibility of walking some of Paddy’s route on 2011. Watch this space! This entry was posted in In Paddy's Footsteps, In Tearing Haste and tagged Deborah Devonshire, In Tearing Haste, Patrick Leigh Fermor on August 23, 2010 by proverbs6to10.